So I have been regularly visiting the Swans Pond with not much to report … until today ! I biked it down as usual but found them building a nest a little bit up from where the had built one last year, but it is still close to the path so that is good for me being able to film them. There has been a lot of rainfall the past few days here in Scotland and the rivers and ponds have high water levels in them just now, but the swans seem to have built it up nice and high so hopefully it wont get washed away like their previous nest they had built 3 years ago. Once I had filmed them I was heading towards the Thunder-bridge to go home but my path was blocked by the Bannock burn over flowing so I had to turn back from the way I had came. When I go to the swans nest I noticed something in the nest as , awesome ! it was an egg already, so I got out my camera and took some more video of it. So good news for the swans and hopefully we will see some cygnets this year ! 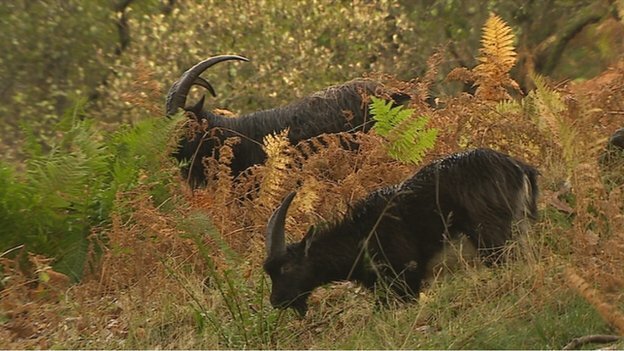 RSPB Scotland has resumed a controversial cull of feral goats on the eastern shore of Loch Lomond. The environmental organisation is facing criticism from local people, who fear the cull could wipe out the entire population of goats around Inversnaid. The animals are popular with tourists and walkers on the West Highland Way. But their voracious appetites cause problems for conservationists and RSPB Scotland says it needs to protect the rich woodland habitat. It wants to reduce goat numbers in the Inversnaid area from about 69 to 30 in the coming years. “This is Scotland’s rainforest. We’ve got a huge range of moss and lichen here. In fact, 5% of all of the world’s moss species are represented in Scotland and this habitat is an excellent example of that diversity. Twenty goats are due to be shot this year. The local community council and the British Feral Goat Research Group believe the remaining population may be too small to survive a series of harsh winters. “If the goats were at a low number and we had two or three successive bad winters then we would end up with no goats. But Scottish Natural Heritage has backed the cull. “A recent survey found that goat numbers are higher than previously thought, and the cull is necessary to bring numbers down to a more sustainable level. Pollochro Woods is a protected natural site and part of the Loch Lomond Woods Special Area of Conservation. Meanwhile, Forestry Commission Scotland has pledged to consult with the local community on plans to reduce goat numbers in the wider area. “There is a real need to balance the long-term restoration and management of Loch Katrine, Loch Ard and surrounding areas with the increasing numbers of feral goats. FWN filmed some wild goats two years ago near Loch Katrine, amazing to see these interesting animals in there natural habitat. Surely a reintroduction of wild cat and Lymx would keep the deer and goat numbers down if these organizations are that concerned about them damaging the environment. Man!!! is the most destructive element in climate and environments. Wild lynx could be allowed to roam the Scottish countryside for the first time in almost 1,000 years under plans by a group of leading wildlife experts. After meeting up with Raymond on the Sherrifmuir above my home in Dunblane, and after photographing a cuckoo over the past couple of days, where I managed to get some nice still shots , I was still looking for some good film footage. Ray had come to my rescue, after a discussion between us I informed Ray to get his film camera ready as I was going to call the cuckoo in with an old trick of mimicking the cuckoos call ! first time as well as you can see on the film. I successfully called the cuckoo in to our location and Raymond as usual got superb film of it with the added bonus of a chaffinch mobbing it. We now have a Scottish cuckoo whisperer ha ha.ha.!!!!!!!!!!! Some Of The Photos I Took. Bird watchers and hillwalkers are being asked to keep an eye out for hen harriers in an attempt to conserve their numbers.